A car-sized robotic spacecraft called LADEE, or Lunar Atmosphere and Dust Environment Explorer, leaves on a mission to the moon as early as Friday, September 6. 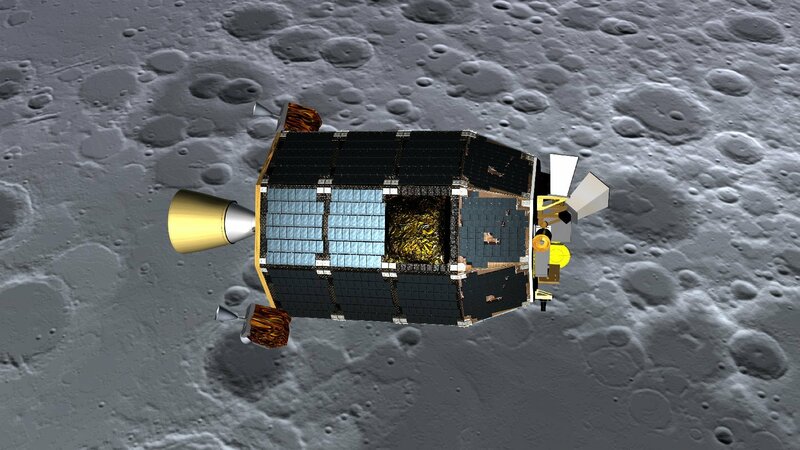 LADEE will orbit the moon for about three months – picking up and analyzing samples from the lunar atmosphere and beaming data back to Earth – before self-destructing in an intentional crash landing on the lunar surface. The $280 million LADEE mission was commissioned by NASA Ames Research Center, in Mountain View, to answer a 41-year old mystery, one that was sketched out in December of 1972 from inside the command module of Apollo 17 as it orbited the dark side of the moon. Greg Delory, deputy project scientist on LADEE mission, came in to KQED recently to tell the story, and what his team hopes to learn. DELORY: Imagine you’re an Apollo astronaut, riding in the Apollo command module as it orbits around the moon. You’re looking out the window, trying to take it all in, looking at the dark side of the moon. It’s very dark. You’ve got starlight against the blackest sky you can imagine. Cernan saw a faint glow on the lunar horizon. That was expected. There’s a phenomenon called “zodiacal light,” which is basically sunlight and starlight scattered by dust that we know about. But then something happened that no one expected. On top of this zodiacal light, Cernan saw these bands of light. They looked like streamers coming up form the lunar horizon. I would compare it to aurora borealis. This was not consistent with anything we know about the moon. We owe him a big debt of gratitude because he did sit down and actually sketch this out, and describe it for us. It’s a little strange when we put together a science program based on an eyewitness account. But it’s part of the evidence we have. And the best explanation we have for it is a population of dust particles between 5-10 millionths of a meter in diameter, levitating off the surface by a few feet. That may be an apt analogy. It could be electrostatic. The surface of the moon gets charged up in space because of sunlight and because of charged particles that impact the surface. So that could cause dust to levitate, to get repelled. So it may be not all that different from a situation where you've got a carpet that people have been walking over and it's all charged up. Is lunar dust like Earth dust? Lunar dust is not like anything we on Earth have much experience with. It's like little shards of glass. It's actually pretty nasty stuff and you wouldn't want to breathe it. It exists in this airless environment with no wind, no erosion, no water. So when it breaks off it's sharp and angular and jagged, whereas Earth dust is smooth and rounded. Which could be a problem for potential future missions to the moon, right? "Now may be out last chance to characterize the pristine lunar environment. You can almost think of it like a fragile, future national park before all the tourists arrive." Yes, we worry about the toxicity of lunar dust, about it's interaction with robotic systems and people. Astronauts testified that there was a gunpowder smell when they brought their spacesuits inside, so that brings up the possibility that there could be a chemical reaction when the dust hits the spacesuit. There's a lot we need to learn about lunar dust. It's big on the agenda in terms of safety and reliability. But it's been a long time since humans went to the moon. The manned moon program ended with Apollo in 1972. Do you see people – rather than just robots – returning to the lunar surface anytime soon? It's a matter of when. We go through cycles. I'd say we've just gone through our second renaissance in understanding the moon. You've got the lunar reconnaissance orbiter; you had LCROSS impact, showing there's was water in the poles. You've got LADEE coming up. 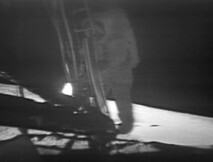 Neil Armstrong (1930–2012), commander of NASA's Apollo 11 mission, descends the ladder of the Apollo Lunar Module to become the first human to step foot on the surface of the Moon. The Chinese recently announced that they're going to put a lander down somewhere on the moon. We're learning the details as we speak. They're doing that in December, during the LADEE mission. So LADEE will be there at the same time as the Chinese spacecraft. Is that going to be a problem? Well, [the Chinese mission] is going to perturb the lunar environment and we're going to see the effects almost immediately. But it's not a negative thing. With LADEE, we can look at the environment's response to the [Chinese spacecraft's] landing, and it's almost like a scientific experiment. 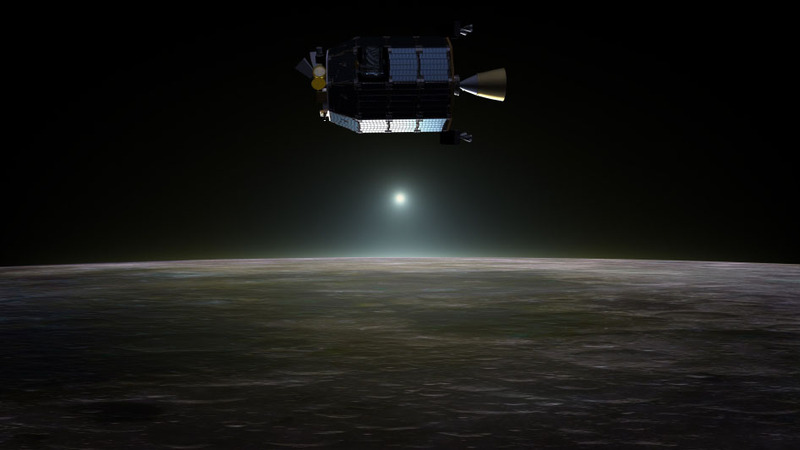 Now's a great time to do LADEE because it may be out last chance to characterize the pristine lunar environment. You can almost think of it like a fragile, future national park before all the tourists arrive. So we'll have at least a few months to do that before other landers start coming along, including the Chinese lander. LADEE is also a test run for a new way of getting data back to Earth, right? Tell us about that. I don't know if If you remember using a dial-up modem, ever? how excited were you when you got DSL, or cable internet. That's what this new laser system feels like for scientists. Today, the communications system is based on radio. This is relatively long wavelength electromagnetic waves which carry information back from the moon at dial up modem speeds. So we're constrained to this tight spigot. Meanwhile, instruments are getting capable. We want to send back high-definition images; we want to send back video, from the moon and from Mars. A laser system uses laser light to encode the information. It's the same rationale for why cable companies want to go to fiber optics. So how to do that from space? Well, you can't string a cable. So you have to bring a ray gun, literally. But it's just a demonstration. You don't want to couple your mission success with the technical risk that the laser system could fail. The laser demonstration will send a test pattern to demonstrate that it works. And put it on the road to interplanetary use. NASA Ames is hosting a science night from 5 to 9 p.m. PDT Friday, Sept. 6, on Shenandoah Plaza in the NASA Research Park at Moffett Field, Calif. Exhibits will be on display and Ames scientists and engineers will be available to speak about LADEE and other NASA programs and projects.